The Tentative Budget is available for review on the Town’s website at www.townofmamaroneckny.org. One of the initiatives the Town Board is exploring is a shared service with the Mamaroneck School District. The Town Board is also in the process of interviewing consultants to embark on an update of the Town's Comprehensive Plan. On the social front, community spirit was running high in September and October with lots of block parties. Many residents took the opportunity to gather with their neighbors for food and fun. The county-wide non-profit organization, Sustainable Westchester, announced its negotiated new two-year fixed rates for all participating municipalities. Effective January 2019, the Community Choice Aggregation (CCA) Program's new rates will be 7.96 cents/kwh for 100% renewable energy. That means Town residents who are Westchester Power or Con Ed customers will receive electricity supply rates that are lower than the 2015 Con Edison utility supply average. Another key feature of the new contract is that rates will be the same for both residents and small businesses. The green supply of energy will be matched with NYS hydropower renewable energy certificates. Residents can always opt out with no penalty by calling Westchester Power at 914.242.4725, extension 103. The charts below show aggregate savings for residents in the Town and savings per household account. 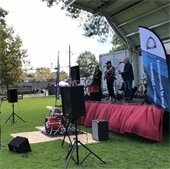 The Town sponsored the Second Annual Food Truck Festival on October 20th. There were 16 food trucks, live music and games. Emergency service responders were in attendance and their vehicles were on display. Fortunately, we had great weather. There were lots of happy people eating delicious food. Thank you to the many Town employees for their participation and special thanks to the Recreation Department who spearheaded the event. The Hommocks Conservation Area Coastal Cleanup on September 15th was very successful. More than 50 people participated and together they collected seven bags of commingled recycling, 100 pounds of garbage and one box of recyclable paper. The Town, along with the Village of Larchmont, celebrated the one year anniversary of the Food Waste Recycling Program on September 22nd at the Larchmont Farmers Market with fun giveaways. Many thanks to Food Waste Superstar Volunteer Karen Khor. Highway Superintendent Lou Martirano retired this past month and we wish him well. Lou headed the Highway Department that maintains Town roads, sidewalks, curbs and parks as well as responds to storm issues. He was also in charge of the Central Garage that services the Town's vehicles. Speaking of storms, Con Edison has a new system for communicating with residents via text messaging. To sign up, simply text REG to 688243 and follow the prompts. In order to do this, you'll need your account number. To retrieve your account number, either log onto your Con Ed account or refer to your bill. More information is on the Con Ed website at https://www.coned.com/en/services-and-outages/text-alerts. This month we honor Katherine Pannell. Katherine moved to Larchmont with husband David Reavy and their three children in 2009. Katherine is a full-time mom, part- time software engineer and member of a women's choir called "All the Singing Ladies!" She helped lead Chatsworth Avenue School's PTA Wellness and Nutrition committee for two years. Katherine is helping the Town work on a Reusable Bag Initiative that she hopes will result in legislation banning single use, carry out plastic bags. Katherine says, "We really need to reduce the quantity of plastic that ends up in our beloved LI Sound and our oceans." Thank you Katherine! 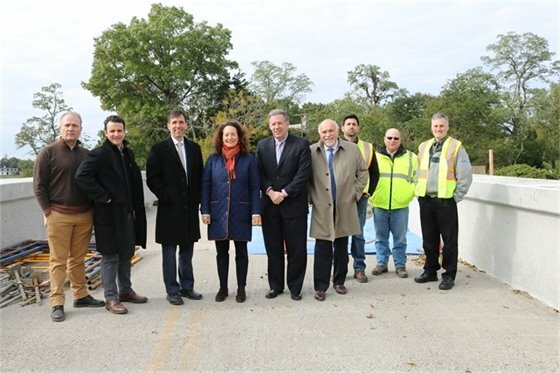 A joint project between the Town of Mamaroneck and City of New Rochelle will give new life to a beloved local bridge. The Pryer Manor Road bridge (aka Red Bridge) is part of Pryer Manor Road, a roadway over the tidal waters of Premium River at its junction with Premium Mill Pond. These waterways form the boundary between the Village of Larchmont (Town of Mamaroneck) to the east and the City of New Rochelle to the west. The date of the original bridge construction is unknown, however, the bridge did undergo a major rehabilitation in the early 1990’s. Due to tidal action, the bridge's arched openings have deteriorated over the years. It is anticipated that the bridge rehabilitation project will be completed in approximately three months during which Red Bridge will be closed. We apologize for any inconvenience. New Rochelle and Town officials on "Red Bridge"
Budget Meetings: Monday, November 5th, Monday, November 12th and Wednesday, November 14th from 5:30 pm to 8:00 pm in Conference Room D at the Town Center. Please note the Maxwell Avenue Sanitation Facility will be closed and there will be no garbage collection on Monday, November 12th. Town Offices will be open. Work sessions begin in Conference Room A at 5:00 pm followed by the regular sessions at 8:00 pm in the Town Center Courtroom.